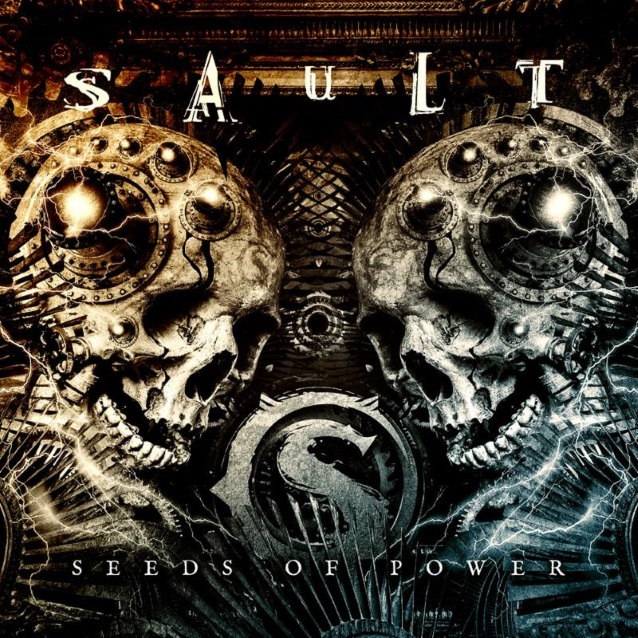 Rhythm-driven heavy rock band SAULT — featuring members of internationally acclaimed power metal group KAMELOT and groove metal outfit ARCANIUM, and guest appearances by members of KING DIAMOND, ONE EYED DOLL and more — will release its debut full-length album, “Seeds Of Power”, on March 2. Pre-orders are now available via www.saultband.com/shop. The official playthrough video for the song “Guilt” can be seen below. The clip, which was shot at Tampa’s LaLa Studio a few weeks ago with Angel Vivaldi, features guest drummer Casey Grillo, Curtis Jay on guitar and Sean Tibbetts on bass. SAULT originally formed in 2014 as a solo project of acclaimed bassist Sean Tibbetts, who sought to write hookier metallic rock music while not in the studio or touring with his full-time band KAMELOT. After deciding to branch the project out to a full band, Tibbetts joined forces with solo guitarist/tattooist Curtis Jay, and — after an introduction via ONE EYED DOLL and SAULT guest vocalist Kimberly Freeman — linked up with singer Benjamin Riggs of groove metal group ARCANIUM. “Seeds Of Power” features the talents of two rotating drummers — Matt Thompson (KING DIAMOND) and Casey Grillo (KAMELOT). SAULT is kicking things off with the release of a music video for the catchy heavy rock track “Adonai”. The clip was filmed by Bad Trip Films and produced by Roy Warner in Detroit, Michigan. SAULT draws influence from the heyday of ’90s alternative and grunge rock — ebbing and flowing with inspiration from bands like TOOL, LIVING COLOUR, SEVENDUST, SOUNDGARDEN and beyond — and accented by a further heavy metal impact. The sound is catchy and hard-hitting that will appeal to diehard rock fans and metal headbangers alike. “Seeds Of Power” was recorded using the power of the Internet, with different members recording their parts in Florida, Kentucky, Colorado and Texas. The album was then produced, mixed and mastered by Oliver Palotai (KAMELOT, ULI JON ROTH, DORO) in Stuttgart, Germany. Vocal tracking is credited to Adam Stewart of ARCANIUM and additional vocal edits were made by Jason Sewell of ONE EYED DOLL. Contributing writers on the album include Kole Kruger, Vic DeLeon and Jeff Garner.